LIENZ, Austria, July 5, 2013 – The Durst Rho P10 250 UV Inkjet Digital Printer, equipped with Durst’s 10-picoliter QuadroTM Array prints heads and breakthrough VariodropTM ink delivery technology – with important implications for grayscale printing and other precision imaging – was named “Best UV Hybrid Printer” over €200,000 ($250,000) by the European Digital Press Association during last week’s FESPA ’13 trade show in London. The European Digital Press Association, now in its seventh year, comprises 20 influential trade member magazines covering 23 countries and representing more than 1 million readers. The EDP Technical Committee evaluates competing products and then makes recommendations to the EDP General Assembly, whose membership is all EDP editors acting on behalf of the total readership. The General Assembly considers the recommendations, but it has the last word in selecting award winners. According to the Association, products are judged on the value of the new technical abilities they offer. This could be innovation in the technology that improves speed, quality, usability and functionality, or that reduces environmental impact and cost to the user. The 98-inch Rho P10 250 UV Inkjet Digital Printer is designed primarily to output a wide variety of crisp, detailed, eye-level materials – backlit signage, POP and commercial displays, small packages, etc. – cost-effectively and at production speeds. 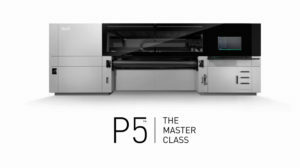 Its 10-picoliter Quadro Array print heads produce the finest color graduations, virtually perfect color reproduction and exceptionally sharp images. Variodrop technology enhances image quality further by improving color gamut and minimizing banding, and helps overcome some of the errors that can occur with traditional greyscale printing. The P10 250 is a true hybrid machine capable of printing on the widest range of media and switching from rigid to roll media quickly and easily. It features mechanical front shops for printing parallel boards simultaneously, the addition of light colors and process colors (orange and violet) without loss of speed, and high reliability. The addition Variodrop technology also enhances productivity, which is increased by up to 25 percent. By increasing the drop size up to 15 picoliters for high-speed printing, the Rho P10 250 is capable of output speeds of up to 2,580 s.f./hr. With unrivalled production efficiency capable of uninterrupted 24/7 printing, the Rho P10 250 is a true industrial printer. Durst Phototechnik Digital Technology GmbH is a leading manufacturer of professional digital imaging systems. The company operates manufacturing facilities in Brixen, Italy, and Lienz, Austria, and has major offices in the U.S., France, United Kingdom, Germany, Spain, Mexico, Brazil and Singapore. Durst’s reputation for quality, precision, innovation and reliability spans more than 75 years.